Wash hands. Preheat the oven to 325˚F. In a medium bowl, combine the melted butter and crushed graham crackers. Evenly spread the mixture on the bottom of a greased 9 x13-inch baking pan. Place in refrigerator to chill. In a large bowl, combine the cream cheese, eggs, vanilla, and sugar. Stir until mixture is smooth. Spread half of the cheesecake batter into the chilled baking pan. Place in freezer. Add the pumpkin puree to the remaining cheesecake mixture and stir until well blended. Evenly spread the pumpkin cheesecake mixture over frozen cheesecake mixture. Make the crumb topping: in a medium bowl, combine the butter, flour, brown sugar, chocolate, and cinnamon. Stir until well blended. Top the cheesecake with the crumble topping and bake for another 25 minutes. Cool cheesecake until it reaches room temperature. Cut into bars. 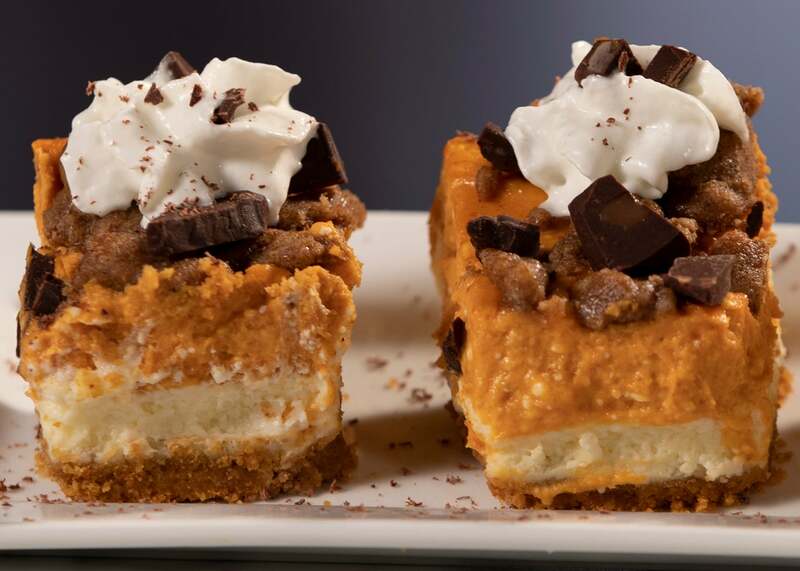 Serve with whipped cream and pumpkin spice, if desired.